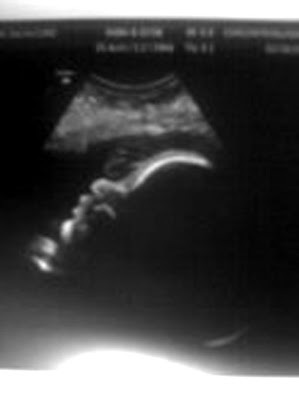 Here is an ultra sound photo of Ben's profile. It's the best pic we have gotten so far! Liam had his hand in front of his face, so no good ones of him. Things are going well. Liam needs to fatten up a little! He is just about 4 1/2 lbs and Ben is almost 6 lbs! They were a little concerned about Liam but we had a more advanced ultrasound done down at EVMS, and looks like they are both fine! I have been having some contractions and am really uncomfortable! Liam is head-up/breached, so looks like it will probably be a c-section. So, not ideal but thats ok. I am hoping and praying that they come by April 1. I'm very ready to meet these boys! oh--he is so cute! Look at those lips! That is so amazing! It's a little person in there! I guess I should say 'people', but that just sounds crazy! I've been praying for both you and your 'girth' LOL! You're almost there, friend... I pray for you every time I'm up at night uncomfortable and can't sleep... which has been quite often lately. How adorable!! Best of luck!